More known for his multi-volume series than for his stand-alone books, Gene Wolfe hasn’t written a non-series novel in 16 years. Pirate Freedom bears the proud distinction of being a Sci-Fi channel “essential read”, as far as I can tell because it happens to have come out in the wake of Pirates of the Caribbean. The publishers are happily going along with this and have made sure that the guy on the cover bears a vague resemblence to Jack Sparrow. 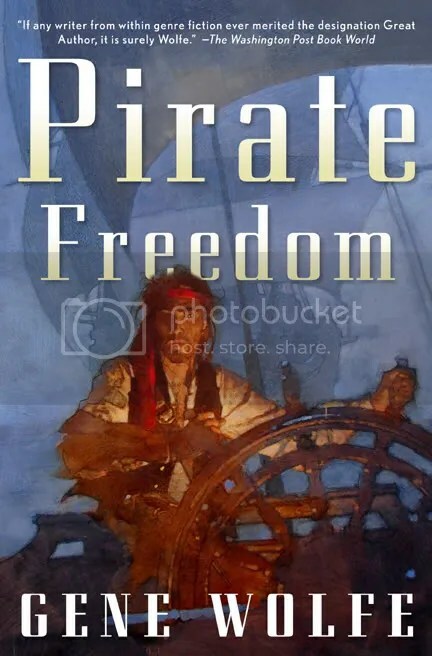 To be fair, as a response to the increasingly irritating Pirates franchise, Pirate Freedom does a good; it manages to be historically accurate and avoids whitewashing the subject, but at the same time avoids going too far the other way; Wolfe understands that a good pirate story should be fun and exciting, not po-faced and grim. However, Pirate Freedom isn’t just a response/tribute to Johnny Depp; it’s also Wolfe’s meditation on his own religious beliefs. The main character (and narrator) is Father Christopher a kid from the near future who moves to Cuba with his mafioso father after the fall of the Communist regime. While his dad opens up a casino, Christopher is shunted off to a monastery that doubles as a private boarding school, and eventually becomes a novice there. At some unspecified age – I’d guess 16 or 18 – he decides to leave, but when he does so he isn’t in the mid-21st Century but the late 17th, when the monastery was built. Fans of writers aren’t like fans of movie stars or musicians, and in turn writers aren’t dragged out into the public eye to the same extent. I am not aware of anyone who has a poster of Stephen King adorning their bedroom wall. So far as I am aware, FHM have never asked J.K. Rowling to do a photoshoot for them. Teenage girls do not mob Garth Nix as he walks down the street, and nobody daydreams of patting Gene Wolfe on his egg-shaped head and gently sniffing his walrus-like moustache. No, what really excites the fans of writers is the opportunity to get their hands on more words of wisdom from their favoured writer, whether this is in the form of an interview or a speech or a letter. 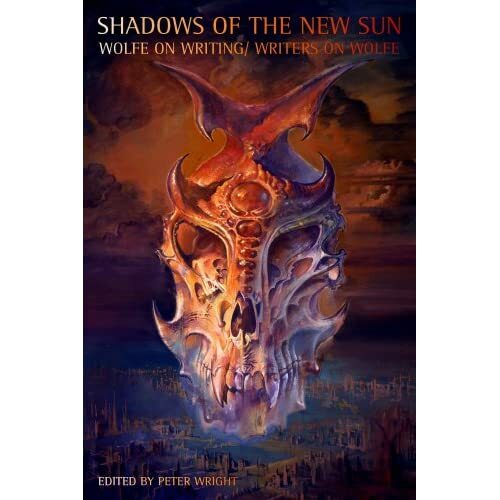 For devotees of Gene Wolfe, Shadows of the New Sun: Wolfe On Writing/Writers On Wolfe offer all three. The first segment compiles all the major interviews Wolfe gave between 1973 and 2003; the second, much smaller segment, is a small collection of short essays and transcription of speeches composed by Wolfe on the subject of writing, books, and the literary world in general. By far the biggest treat are the short pieces which seem to be by-products of various writing classes Wolfe has given over the years, which give us a chance to learn at the feet of “balding, avuncular Gene” and hear his thoughts on characterisation, good writing habits, and the special problems of writing science fiction and multi-volume novels. 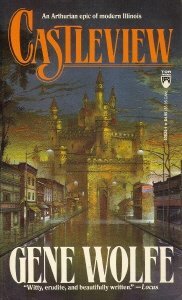 Something must have been in the water in 1990 – at the same time as David Lynch unleashed Twin Peaks, his soap opera about murder and danger in a tranquil American small town influenced by otherworldly forces, on a TV-viewing public, Gene Wolfe published Castleview, a meditation on a very similar topic. The town of Castleview in Illinois is named for the ethereal castle which can sometimes be seen at dusk in the distance. Of course, it turns out that this is no optical illusion, but a symptom of the recurring presence and intervention of a strange otherworld in the daily life of Castleview – an otherworld which explodes into frenzied activity with the murder of factory foreman Tom Howard and the arrival of the Shields family. This is one of four novels set in the modern day that Wolfe wrote between 1984 and 1990 – the others are Free Live Free, There Are Doors, and Pandora, by Holly Hollander. Raging Wolfe fanboy as I am, I’ve been slowly reading and reviewing each of them – partially because they’re frequently overlooked pieces of the Wolfe canon. In the case of Free Live Free and Pandora this is probably justified – Free Live Free fizzles out, and Pandora seems to have been a misguided attempt to try and write for the young adult market. Not so for Castleview. 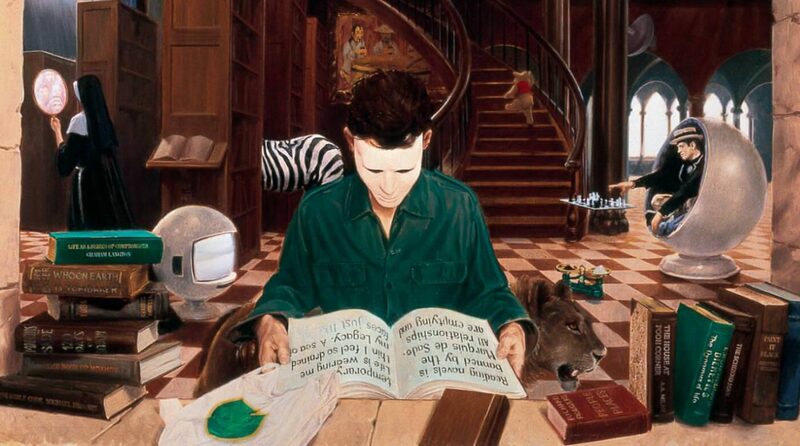 Whereas Free Live Free and Pandora represent Wolfe at his most straightforward, Castleview harks back to the engaging obliqueness of his early novels The Fifth Head of Cerberus and Peace. The first three quarters of this book are by far the best, and depict a series of apparently-unconnected accidents and events that happen over the course of a single day – the links between which swiftly become apparent. The fairy intruders into the small town thrive on coincidences, misunderstandings, and near-misses, and work their evil deeds in the spaces between accidents; Wolfe does an excellent job of keeping his protagonists confused but keeping us relatively up to speed (although he does pose a number of problems for readers to work out in their own time), and most of the time the tower of accidents seems entirely believable. Wolfe also allows his knowledge of folklore and mythology run riot in a way which he didn’t in, say, Free Live Free, and he seems to be enjoying himself a lot more than when he was writing that one; he would serve up another the blend of fairy lore, Norse myth and Arthurian legend (with tenuous connections with the modern world) in The Wizard Knight. However, Wolfe enjoys himself that he builds the house of cards a little too high – Katy Howard, the suicidal sister of Tom’s wife, seems entirely surplus to requirements – and the last quarter of the novel the pacing goes a little askew. Since the majority of the novel takes place in a single crazy night, it wouldn’t have taken that much work to complete the story in that one night. Instead, Wolfe slackens off the pace abruptly before the excellent final confrontation. That said, Castleview does offer an original take on the fairy myth, especially in the way that the “fairies” seem to have no form beyond those they borrow than us. Just as they spend a lot of time mimicing real people and animals, living and dead, there’s nothing to say that they’re not also mimicing our mythology when they take on the form of fairies and gods and figures from the Arthurian stories. The concept of a race of beings who have no shape except those that we give them comes up again and again in Wolfe’s writing – from The Fifth Head of Cerberus to The Book of the Short Sun to The Wizard Knight – so any Wolfe scholar will want to read Castleview to trace the evolution of this theme. (It also depicts Wolfe’s unabashed love of small-town America, in contrast to – say – David Lynch’s brutal dissection of it in Twin Peaks and Blue Velvet.) Casual readers will also enjoy it, but – like the other books in Wolfe’s mid-to-late 1980s quarter – it’s currently out of print. Pick it up if you can find it second hand. Free Live Free occupies an odd place in Gene Wolfe’s body of work. It is one of only four novels he has written set in modern-day America – the other three are the fantasies There Are Doors and Castleview and Pandora, by Holly Hollander, a straightforward detective story packed with classical allusions and an engagingly naive narrator. 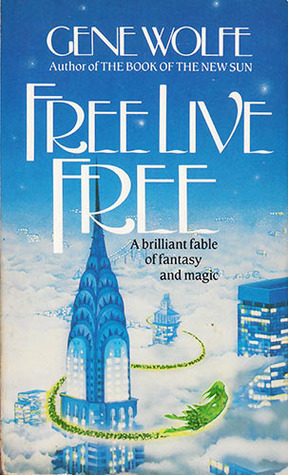 The bulk of Free Live Free is a detective story, but there are liberal doses of conspiracy thriller and science fiction added to the mix, as well as some ambiguously supernatural could-be-fantasy elements. The constant shell game Wolfe plays with genre in this book works to its advantage, since the reader is forced to constantly reappraise their assumptions about what the High Country might be. Reviewing the third book in a series is always difficult. 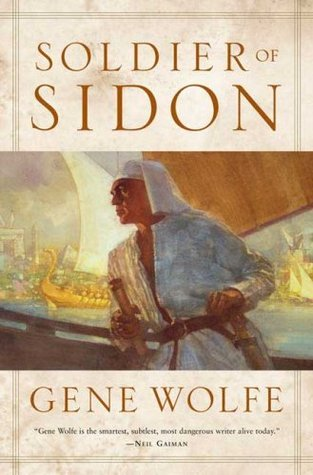 Soldier of Sidon is Gene Wolfe’s follow-up – seventeen years after everyone had assumed the story had finished – to Soldier of the Mist and Soldier of Arete, most commonly available these days compiled as Latro In the Mist. So, first I am going to do a quick introduction to the series so that people can see if they want to plough through Latro before getting onto Sidon. Then a spoiler-free review of the book for Latro fans who want to know whether they want to read it. Lastly, I’ll share my thoughts on the book in a spoiler-filled conclusion. The Latro novels are historical fantasies, in which Gene Wolfe allows himself free reign to indulge his Classics geekery. They centre on the pseudonymous “Latro”, a Roman mercenary from the 5th Century BC; Rome has only recently become a Republic, and is an obscure city off to the north and west of the major players on the world stage: the city-states of Greece and the Persian Empire. The Greco-Persian wars are in full swing, and Latro has come to fight as a mercenary captain for the Emperor of Persia; in a battle on the front steps of a temple, he is struck on the head and falls unconscious. When he awakes, he has been brain damaged – cursed by the gods – with the loss of his short-term memory. Anything that happened more than a day a go he forgets – unless he writes it down in a manuscript he keeps with him at all times. The novels are Gene Wolfe’s “translations” of Latro’s diary. As Latro is told time and again in the books, to be cursed by the gods is to be touched by the divine, and if you’re touched by the divine there is something of the divine about you always; Latro can see the gods and spirits of ancient Greece, and if he touches them other people can see them too. For the first two books in the series (written in 1986 and 1989 respectively), the emphasis is on Greek mythology and history, as Latro tries to find his way home; in Soldier of Sidon, the action shifts to Persian-controlled Egypt, as Latro and various companions are sent on a mission south to scout out Nubia for the Persian Emperor. As the novels continue Latro sometimes remembers to read his scroll in the morning to remind himself of where he is and who the people around him are, and as such his behaviour and attitude towards them changes and shifts. The question lots of Wolfe fans are probably asking is “is this book really necessary?” I’d give that a qualified “yes”; qualified, because we’ll only really know the answer when the fourth Latro book comes out – Wolfe is already planning it. I suspect this fourth book will conclude a lot of the strands begun in this one, considering his tendency to work in pairs (the first two Latro books, the Wizard Knight two-part series) and quartets (The Book of the New Sun, The Book of the Long Sun). At the same time, I think a couple of the threads running throughout the book reach a conclusion by the end, though you have to pay attention. And that’s the thing with the Latro books – so absolutely does Wolfe stick to the central schtick that you need to pay close attention. Latro, as narrator, is in no position to remind you of what’s going on, since he’s confused and disoriented much of the time, although he repeats himself enough that an attentive reader can keep things straight. And again, as with the rest of the Soldier series, Wolfe uses this to play games with the reader. Things happen in this book, important things – Latro’s nature changes, his quest to regain his memory progresses, old friendships are renewed and wrecked as the story progresses. While you’re in the middle of reading the book, however, sometimes these things aren’t so apparent. In retrospect, this was a pretty fine book, but you have to sit through all of it to see and appreciate the whole picture. This was true, to an extent of the earlier Soldier books, but is more apparent in this book. Then again, I read it over the Christmas season and had to set it down for a while – if I was able to give it my full attention I might have enjoyed it more. In the end, that’s the problem with this series – if anything external makes you put the book aside for a few days, it’s too easy to lose the thread of the story.